Window feeders are exciting because they bring the birds within a few inches of the window. Having a feeder on the window can also help prevent birds from flying into the window because they perceive that something is there. 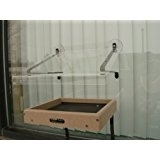 Our Double Tray Window Feeder is ideal for offering seeds, seed blends, shelled peanuts and mealworms live or dried). It's easy to mount, fill and clean, and it's backed with a lifetime guarantee. Get up close and personal with the birds in your backyard. Our Window Feeder brings birds so close it feels like you could almost reach out and touch one (but don't scare them away). 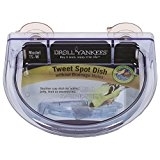 Great for blends, peanuts and safflower, this durable feeder attaches right to your window pane with suction cups, allowing you to see every bird detail. It's easy to fill, easy to clean and backed with a lifetime guarantee. 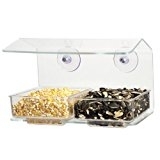 This smaller open tray feeder has a roof and is made out of polycarbonate. Perfect for feeding smaller birds, just fill with your favorite seed blend or try Bark Butter® Bits for a high calorie treat. 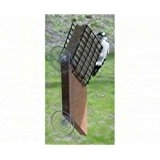 This clear weather guard is the perfect size to keep your Tweet Spot® feeder free from rain and snow. It gives the birds a shelter in poor weather conditions and guarantees your feathered friends will hang out a little bit longer. 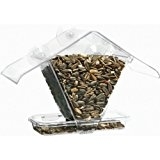 This suet feeder has durable suctions to ensure it will stay put. It can hold any regular size suet cake and comes with a tail prop for more comfortable feeding for your woodpeckers. You are sure to get a show with this one! With our Decorative Window Hummingbird Feeder, only a window pane stands between you and "the jewels of nature" — hummingbirds. 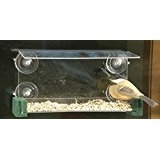 This feeder is easily mounted to any window with two suction cups, and its clear bottom allows you to see hummingbirds quickly lap up the nectar solution. 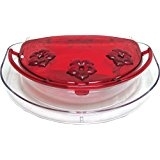 The Decorative Window Hummingbird Feeder features three feeding stations and a moat that, when filled with water, will keep ants and other crawling insects out of the feeder. It's also easy to clean and comes with a lifetime warranty (even if it falls to the ground). These little glass vials are perfect for feeding your Hummers! Since they don't hold as much nectar you will have to refill them often which the hummingbirds will appreciate. They are extremely picky about the freshness of their nectar. Replacement vials available. This comes in a single tube or double tube (pictured here). 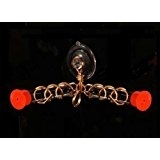 Made of a super strong polycarbonate this hook will not crak, yellow or peel. It can hold up to 3 lbs and is perfect for most hummingbird, suet feeders or finch socks. 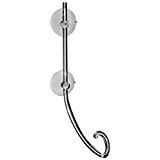 Can be mounted with hook up or down. Every year, millions of birds are injured or die after colliding with windows. WindowAlert is a decal that reflects ultraviolet sunlight, a light that is invisible to humans but very alerting and harmless to birds. Easily apply WindowAlert to your home or office windows and help prevent dangerous window strikes. 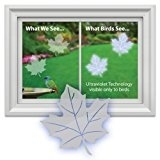 WindowAlert will not prevent aggressive bird behavior resulting from seeing a bird's own reflection. 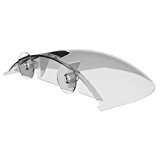 Each decal measures approximately 4” across. As a rough guide, we recommend 1 decal for every 3’ x 3’ section of glass.